Not unlike The Shop around the Corner in the movie You’ve Got Mail, only with yarn instead of books, Walker and Daughter is a cute, little knitting shop hidden in the deep recess’s of New York City’s Upper West Side, run by single mom Georgia and her twelve-year-old daughter Dakota. It’s a place where a potential sale is never denied, where the door is never fully shut until well after closing time and the last straggler has had a moment to muse and ponder over the choice of wool or cotton. A place where not just stray pieces of yarn gather, but friends; women with virtually nothing in common but one general purpose: to knit together something in their lives. Georgia and her precocious daughter are not alone in their efforts. There’s her mentor and stand-in mother, Anita, a well-established-in-life sort of friend; Peri, a pre-law student with a penchant for knitting handbags; Lucie, a tv producer who’s lost her way; Darwin, an annoying graduate student; and Georgia’s old high school friend Cat, a Pamela Anderson sort of socialite on the verge of divorce. Like a knitted scarf wrapped tightly around your neck on a blustery day, so it is with these women in a time of crisis. The yarn is what holds it together and keeps out the cold. 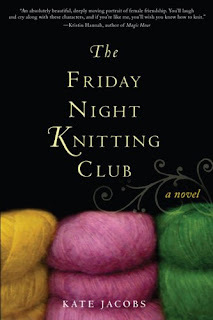 The Friday Night Knitting Club is Steel Magnolias with but a different disease and location; How to Tie an American Quilt with yarn instead of fabric blocks; the Divine Secrets of the Ya-Ya Sisterhood, but without the rebuilding of a mother-daughter relationship and the cool chant. I liked all of these books, FNKC included, which follow a central theme: make the most of one’s life while you have it and a sisterhood can conquer all. "Sometimes these characters just weren’t likeable, but hey, they’re New Yorkers! What did I expect! *cough*"
since i grew up in a state bordering New York, i can say that the Yorkies that live outside NYC aren't all that bad. as for those in NYNY itself, well it's nothing that a couple neutron bombs wouldn't fix. Hey! I loved the New Yorkers when I was there! That was my kind of people. they're okay if you're a tourist. but i wouldn't want one living next door to me. I've been to New York City twice and must say they are definitely an interesting breed, but I know little of the big city life. It's like a different world to me. In the book, Georgia the main character comments that she hasn't driven herself anywhere in like six months. That's just the craziest thing I've ever heard. My sister lived in NYC for years and didn't drive at all when she was there. She hates cars. She prefers to walk or take transportation everywhere. I'd love to do that. I wish that were possible in SA. I felt at home in NYC unlike in other places. As soon as my kids are out of the house I'm buying a red mini cooper and I've already told them I'm only taking grandchildren for rides.